"This is truly a cradle-to-grave relationship between PPG, MTU and WETA," said Doug Schwedland, PPG's vice president of the marine division. "We worked very closely as a team to ensure the propulsion system would be an ideal match for WETA's needs - from fuel efficiency to reliability to environmental sensitivity." WETA's almost exclusive reliance on MTU engines has allowed the fleet to see continued efficiencies, especially in terms of shared parts inventory. The engines also run longer between maintenance intervals, at faster speeds and with decreased fuel costs. To ensure those performance standards are maintained, PPG will be staffing a full-time maintenance crew in the Bay Area for the first time in the company's history. 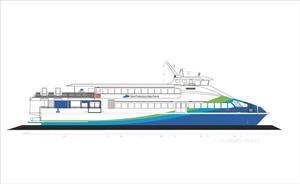 "The faith that MTU has put in us to maintain the existing and new ferries is a great honor and one we look forward to upholding," Schwedland said.